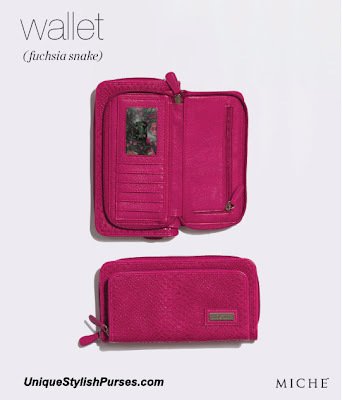 Exterior is bright fuchsia snake faux leather kissed with glossy spots. Large zippered compartment features two open bills slots and eight card slots and is lined with abstract floral fabric in pink, green and black. Smaller zippered compartment has one ID card and five credit card slots along with a zippered change compartment. Silver hardware. Dimensions: 8.25” long x 4.25” high x 1.25” deep. Subscribe to our mailing list below and be the 1st to know on sales, discounts, sneak previews and more!